Article first published as The Best Free iPad Apps of 2011 on Blogcritics. With hundreds of thousands of apps available for Apple's iPad, there are sure to be plenty of quality ones to be had for free. Nevertheless, despite Apple's closed market and quality control, bad apps are commonplace and especially so among those that are free. Below, I present a list of some quality free apps. Those new to the iPad are encouraged to take a look at last year's lists as well (Best Free Apps of 2010 and Best Paid Apps of 2010), and if you have a few bucks leftover or an iTunes gift card from the holiday season, be sure to pick up something from the Best Paid Apps of 2011 as well. DocScan HD - I became aware of DocScan at a recent iPad in Education event. This is essentially a handheld scanner application, but for educators, you could use the annotation features to mimic a document camera, thus allowing for the possibility of adding this device's functionality to your iPad for a mere percentage of the price. Note: the full version, Doc Scan HD Pro ($3.99) offers unlimited captures while the free version offers only six, though cloud storage/sync setups exist. Chase - The large bank made a big splash by touting the new check scanning features of its application. Several banks are hot on its tail, but Chase has made iPad check deposits a reality, thus eliminating the need to visit the ATM or your local branch, and instead doing so from the comforts of your home. On top of the finance chart, you'll find an app from Bank of America, but do note that check scanning is not currently available. Still, most big bank finance apps offer similar functionality that includes checking account balances, making transfers, and linking to credit cards. Calorie Counter and Diet Tracker - It wouldn't be a new year without a few resolutions to complete. And it wouldn't be a new year's resolution in America unless it included either a gym membership or a pledge to lose weight, right? More people are finding it easier to keep track of their calorie counts by using apps such as Calorie Counter either on their iPhone or iPad. With a huge database and a vibrant display, this app makes it easy and borderline fun to keep track of what you eat and how you exercise. Allrecipes - Although not a new app, Allrecipes has received important updates this past year, and the website remains one of my go-to for recipes. The pro version allow you to sync with your recipe box and shopping lists, but the free version offers plenty of on the spot recipe search capabilities including ingredient inclusions and exclusions. iheartradio for iPad - iheartradio made big splashes this year, unveiling a new streaming web service and hosting famous musical acts at a large summer concert. Naturally, an iPad app was a logical next step, and the conglomerate continues to give Pandora a run for its money. I discussed why I still enjoy Pandora more, but it never hurts to have both apps on your iPad. Skitch for iPad - From the makers of Evernote, Skitch is a solid app that allows you to sketch, annotate, edit, and present images with ease. If you ever have the need to add something to an image to then share with someone (think: map, shopping list, family photo, etc. ), Skitch provides a powerful opportunity made by developers who have proven themselves with one of the best apps and web experiences available in Evernote. Gmail for iPad - For those who don't use Apple's native mail application and don't want to use the robust browser version of Google's email program, Gmail for iPad provides a nice alternative. Still missing in the recent version is effective integration into Apple's notification center, but the app remains a step above having to log in via the web browser all the time. Microsoft OneNote for iPad - Not to be left out, Microsoft released an iPad version of its popular program OneNote. Unfortunately, early reviews have not been too favorable, as the free version is only good for the first 500 notes and an in-app purchase for $14.99 is then required. Still, to be able to sync my OneNote notes on my iPad is convenient, though Microsoft will need to update (must include inking) in a hurry to stay relevant, especially in light of all the robust note-taking apps that are flooding the AppStore. Facebook - Finally, Facebook got into the game with a native app for its own program. Early reviews were mixed, and users are quick to point out problems in updates. However, now on version 4.1, Facebook seems committed to making a better product on the iPad. Still, users may be better off opting for another Facebook app such as MyPad+ as discussed in my Best Paid iPad Apps List. Skype for iPad - The release of a native Skype iPad app meant full screen video and use of both the front and reverse cameras on the iPad. In my family, we use Skype regularly as we communicate with out-of-town family and friends. The update could not have been more welcomed by many faithful Skype users with iPads. NBA Game Time Courtside - The NBA is back, and so is the opportunity to follow along with each game on the iPad. Instead of focusing on full streaming and with that comes a usually steep price paid by users, NBA Game Time Courtside keeps the attention on the game watching experience on the television and offers an enhanced accompaniment on the iPad. This means live game stats, video highlights, real-time stat charts, and more. It reminds me of MLB Gameday, though users have to plunk down some cash even for some of the more enhanced features of this app, while NBA Courtside remains completely free. This is a pretty great list, but I was surprised there were no travel apps on here…those are some of the most useful and most used apps available. If anyone is looking for recommendations I have a few, as an avid traveler. Normally I’ll start by booking my trip through something like Kayak or TripIt. I also use a PackingPro app to make sure I don’t forget my phone charger or my contact case or something (which I’m notorious for). I also like to have something like GateGuru on hand in case there are delays in the flight or a change in schedule, which kept me from missing a flight out of Heathrow a few months back when my flight was changed from Delayed to Boarding, with no real notice or explanation. I also like having navigational and translation apps in order to be as independent a travel as possible, and for killing time at the airport or just unwinding in my hotel at the end of a long day I’ll have something like Zombieville USA or Scrabble, or the TV Everywhere app from my employer and TV Provider, DISH. That one is probably my favorite, as it allows me to watch live or recorded TV off my home receiver from anywhere in the world I can get a 3G or wifi connection. Absolutely great for jetlag, too! Again, thanks for the recommendations and I hope you get to check out a few of the travel apps I mentioned. Cheers! What a great comment! Thanks for the recommendations, and I can vouch for many of those solid apps. 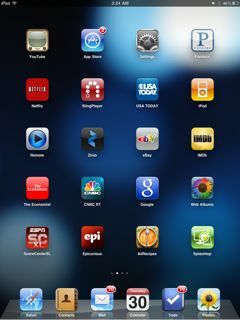 My goal for these lists was to highlight some of the most notable apps for 2011, so it was by no means all encompassing. I invite others to comment on apps that they felt were the best of 2011 both free and paid.